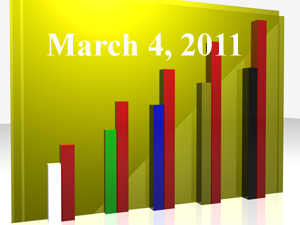 “DOL Fiduciary Hearings: Why 401k Plan Sponsors Need to Pay Attention” (Fiduciary News, March 1, 2011). Since no individual 401k plan sponsors seem interested in testifying at a hearing about an issue intended to protect them, we’ve provided three possible outcomes from the DOL Fiduciary hearings and their implications for 401k plan sponsors. To paraphrase John Adams, numbers, like facts, are stubborn things. Sooner or later, the compelling empiricism of numerology overtakes all that merely feels well. Reality trumps rhetoric. Eventually. It’s still too early to say the will exists today or if it remains in some distant future. “Why Not 401k Plans for Public Employees? – Room for Debate,” (New York Times, February 28, 2011) This is the mighty New York Times, folks. The fact they’re even allowing for a debate means our body politic has come a long way. “Study Finds New DB Top Concerns,” (PLANSPONSOR.com, February 28, 2011) And the winner is… unfunded liabilities! Do we detect a trend here? “Why states shouldn’t adopt defined-contribution pensions,” (Reuters, March 1, 2011) It seems Reuters doesn’t think the New York Times did justice in asking the question. Read both and the article below and decide for yourself. “Why Public Pensions Are Doomed,” (The Motley Fool, March 2, 2011) Here’s another take on the New York Times article. Rather than focus on only one piece of data like the Reuters article, this piece looks at all the data and adds additional facts. The DOL feels the regulatory haze between brokers and advisers hurts investors; hence, the department proposes a new definition of fiduciary to separate those who provide unbiased advice between those who sell products. Let’s see how the industry responds. “Labor Department Rule for 401k Plans Too Broad, JPMorgan Says,” (Bloomberg, February 28, 2011) JPMorgan, a broker who sells investment products, doesn’t want to fall under the DOL’s new definition. The DOL must decide if the new rule is meant to benefit the retirement investor or JPMorgan. “Pension group calls DOL disclaimer for B-Ds ‘unduly harsh,’” (Investment News, February 28, 2011) Brokers and recordkeepers seem to believe providing a short list of mutual fund is not investment advice, leaving one to ponder, if true, whether the average investment adviser wonders why he registered in the first place. After all, why would they voluntarily subject themselves to “unduly harsh” treatment if they didn’t have to. “DOL to Issue Final Rule on Fiduciary by Year-End: Borzi,” (Advisor One, March 1, 2011) To fight off suggestions the DOL will go the route of the SEC and delay its final ruling on the definition of “fiduciary,” no less than Assistant Secretary Phyllis Borzi promises a definitive rule by the end of the year. “In Support of a True, Genuine, Authentic, Real, Not-Your-Broker’s Fiduciary Standard,” (Advisor One, March 1, 2011) Beware the “false Fiduciary Standard,” warns this author. He then explains unequivocally what he expects. “ABC Warns against Too Broad Definition of Fiduciary,” (PLANSPONSOR.com, March 1, 2011) It’s important to understand the membership of the American Benefits Council includes those “either sponsor directly, administer or service retirement, health and stock compensation plans covering more than 100 million Americans.” The ABC goes out of its way to state, beside plan sponsors, members include “professionals in the benefits field with expertise in investments, retirement, health insurance, accounting, actuarial science, banking, law, and benefits consulting who provide service and support to corporate benefit plan sponsors.” Again, it’s not clear which segment of membership this view represents, but you can be sure the broker members of ABC are happy with the statement. “Fiduciary rule change would heap on costs, says SIFMA exec,” (Investment News, March 1, 2011) Again, brokers are complaining about the proposed new rule. It might help if, in at least one of their press releases, they explain how registered investment advisers are able to provide fiduciary services today, often at costs below those charged by brokers. Something just doesn’t add up. “DOL, industry spar over fund lineups,” (Investment News, March 1, 2011) The DOL wants to say “if it floats like a duck, swims like a duck and quacks like a duck, then it is a duck.” Some service providers seem to feel the quacking part doesn’t matter. “FPA Backs Fiduciary Standard, Reaches Out to FSI Members,” (Advisor One, March 2, 2011) Since the FPA doesn’t require “fee-only” financial planning, their putting the investors first might upset some of its membership. Still, it’s refreshing to see an industry group do the right thing. “B-Ds plead for DOL, SEC to team up on fiduciary rule,” (Investment News, March 3, 2011) This article appeared after the conclusion of the DOL hearings. It appears the brokers might not have been pleased by outcome of the hearings, so they’re falling back to the SEC and the controversial Dodd-Frank reform bill. “LABOR DEPARTMENT: Definition of ‘fiduciary’ under scrutiny,” (Investment News, March 2, 2011) A short paragraph with a link to the DOL. “DOLs proposal puts the screws to legacy 401k providers,” (RIABiz, March 2, 2011) As close to a play-by-play of the actual hearings as you can get. “Fiduciary rule change could mean compliance crush for B-Ds,” (Investment News, March 4, 2011) Again we read (and are asked to weep) for the tiny firms and small investors that won’t be able to obtain “free” or “low cost” services. Would these services be “free” or “low cost” if there was honest full disclosure? Remember two years ago. The Capitol was abuzz of hearing condemning the SNAFU sold as “target date funds.” It was a wonderful concept, but the execution left much to be desired. Come to think of it, didn’t the SEC once outlaw funds of funds? Maybe they had it right the first time. “Targeting Fees in Target-Date Funds,” (Wall Street Journal, February 26, 2011) It’s amazing how muddled this article is – and after the title showed so much promise. First, the article impugns a couple specific funds for having expense ratios similar to the average mutual fund. In doing so, it fails to mention high fees caused by TDFs which investing in other funds instead of directly into stocks and bonds. In fact, the article opens with a material misstatement implying most TDFs do invest in stocks and bonds! Second, the article then misstates the same old passive versus active argument, suggesting investors might be better off in index funds rather than actively managed funds because the fees are lower. Apparently, the author didn’t look at the investment results of the “lost decade” which suggest, when it comes to index funds versus passive funds, you get what you pay for. Finally, the article ends with a promise of Senate hearings. Given what we said in the preamble, don’t be surprised to see a “been-there-done-that” reaction. “6 Ways to Evaluate Your Target-Date Fund,” (USNews.com, February 28, 2011) This is an article written for the layman. As a result, it doesn’t really say anything that matters. It doesn’t even provide a substantive warning as to the real problems and potential downside of TDFs. “LABOR DEPARTMENT: Changes to target date funds considered,” (Investment News, March 2, 2011) This article contains links to relevant DOL information, but little else. “Making Target Date Funds More Effective,” (Institutional Investor, March 1, 2011) This article presents an interesting idea: Most people use TDFs in the wrong way – and that might be good! Apparently, in some cases, two wrongs do make a right. “Shifting Strategies for Target-Date Funds,” (New York Times, March 3, 2011) Surprisingly, this is a very well done article. It harkens back to the day when one expected high quality from the New York Times – and the paper of recovered delivered. Still, like the Wall Street Journal article above, it fails to note the significant number of TDFs that invest in other funds. It also doesn’t explain how the shift from stocks after the 2008/2009 market crash may have hurt investors as well as the how the increase in international holdings might hurt investors (both of these may merely have been timing issues, though). There was a reason why they didn’t allow these things in IRAs. Hmm,… What was it again? We really need to do something that separates the advisers from the salesman. It’s not that annuities are always bad, but there’s a suspicion they might not be as much a panacea as advertised. “Next Fund Frontier: Annuity Like Insurance Riders In More 401k Plans,” (Barrons, March 3, 2011) If you’re selling annuities or afraid of annuities, you must read this story. The author writes of a new product on the drawing board of leading mutual fund companies. It’s a mutual fund with an annuity-like insurance rider. Though not technically an annuity, it has similar features. What’s not clear from the article is whether the costs are comparable to annuities. (The article does admit there will be increased costs.) What’s also not care is exactly how this new risk is accounted for and who might be left holding the bad in the case of a catastrophic failure. fi360 Blog: ERISA standard ‘highest in the world;’ but is MSRB a close second?